Miargyrite: Mineral information, data and localities. From Greek "meion" (less) and "argyros" (silver), for it contains less silver than pyrargyrite which it was often mistaken for. The monoclinic dimorph of Cuboargyrite and Baumstarkite. The Se analogue is known as 'UM1987-15-Se:AgSSb'. 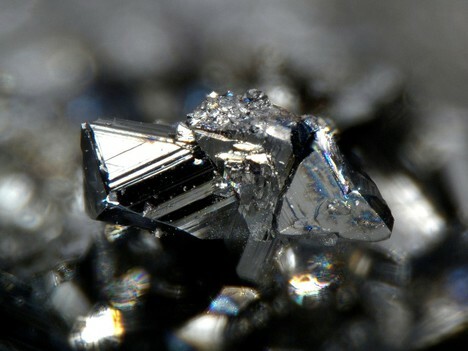 Black blocky, often striated crystals with dark red internal reflections to a cm. The crystals are difficult to orient and often form balls to a few cm. According to Nekrasov & Lunin (1987), the Se-free miargyrite (monoclinic, alpha form) transforms to the cubic (beta) form at 380°C, while the one containing 6.9 wt.% Se - at 300°C. 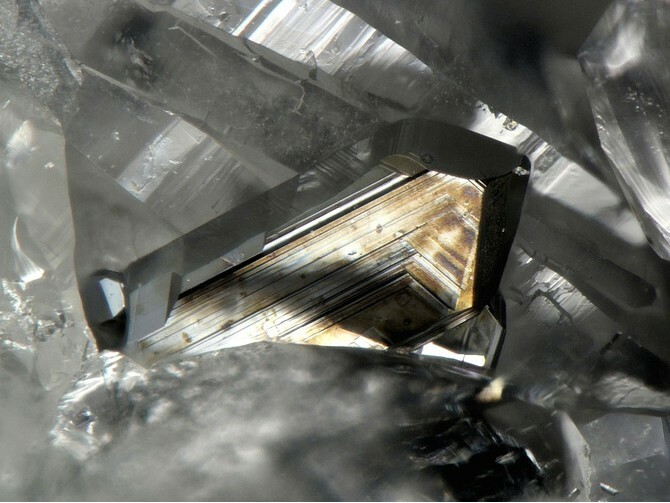 Black, blocky, often striated crystals. Space group C2/c according to reinvestigation of Effenberger et al. (2002); space group was previously assumed to be either C2 (Smith et al., 1997) or Cc (Knowles, 1964). Unit-cell parameters also given as: 12.824(1), 4.4060(3), 13.193(1) Å, 98.567(6)° (Smith et al., 1997). Pyrargyrite 17 photos of Miargyrite associated with Pyrargyrite on mindat.org. Quartz 14 photos of Miargyrite associated with Quartz on mindat.org. Baumstarkite 10 photos of Miargyrite associated with Baumstarkite on mindat.org. Pyrostilpnite 7 photos of Miargyrite associated with Pyrostilpnite on mindat.org. Pyrite 6 photos of Miargyrite associated with Pyrite on mindat.org. Calcite 5 photos of Miargyrite associated with Calcite on mindat.org. Siderite 2 photos of Miargyrite associated with Siderite on mindat.org. Stephanite 2 photos of Miargyrite associated with Stephanite on mindat.org. Acanthite 2 photos of Miargyrite associated with Acanthite on mindat.org. Sphalerite 2 photos of Miargyrite associated with Sphalerite on mindat.org. Hausmann (1805) Hercyn. Archiv: 4: 680. Mohs, F. (1824) Hemiprismatische Rubinblende.- Grundriss der Mineralogie, vol. II, p. 606-607. Rose, H. (1829) Ueber die in der Natur vorkommenden nicht oxydirten Verbindungen des Antimons und des Arseniks.- Poggendorffs Annalen der Physik und Chemie 15, 451-476. Palache, Charles, Harry Berman & Clifford Frondel (1944) The System of Mineralogy of James Dwight Dana and Edward Salisbury Dana Yale University 1837-1892, Volume I: Elements, Sulfides, Sulfosalts, Oxides. John Wiley and Sons, Inc., New York. 7th edition, revised and enlarged: 424-427. Nekrasov, I. Ya., Lunin, S. Ye. (1987) Formation conditions of silver sulfides. selenides, and sulfoselenides in the system Ag-Sb-S-Se, determined experimentally. Mineral. Zhurnal: 9 (l): 25-39 (in Russian); in: Jambor, J.L., Vanko, D.A. (1989) New mineral Names. American Mineralogist: 74: 950. Smith, J.V., Pluth, J.J., Han, S. (1997): Crystal structure refinement of miargyrite AgSbS2. Mineralogical Magazine, 61, 671-675. Effenberger, H., Paar, W.H., Topa, D., Criddle, A.J., and Fleck, M. (2002): The new mineral baumstarkite and a structural reinvestigation of aramayoite and miargyrite. American Mineralogist 87, 753-764. The following Miargyrite specimens are currently listed for sale on minfind.com. DE BRODTKORB, Milka K. Precious metaltellurides and other Te-bearing minerals in different paragenesis of Argentina: A review. Rev. Asoc. Geol. Argent. [online]. 2009, vol.64, n.3, pp. 365-372.; Board, W. S., Kennedy, B., & Yeomans, T. (2011). NI 43-101 Technical Report on the Pirquitas Mine. Metallogenic Study and Mineral Deposit Data Sheets: Dorrigo-Coffs Harbour Metallogenic Map (SH/56-10, SH/56-11), 1992: LB Gilligan, JW Brownlow, RG Cameron and HF Henley. Published by the Geological Survey of New South Wales. ; Gilligan, L.B., Brownlow, J.W., Cameron, R.G., Henley, H.F. (1992) Metallogenic Study and Mineral Deposit Data Sheets: Dorrigo-Coffs Harbour 1:250 000 Metallogenic Map SH/56-10, SH/56-11. Geological Survey of New South Wales, Sydney, 509 pages. McClatchie & Sylvester (1970); Metallogenic Study and Mineral Deposit Data Sheets: Dorrigo-Coffs Harbour Metallogenic Map (SH/56-10, SH/56-11), 1992: LB Gilligan, JW Brownlow, RG Cameron and HF Henley. Published by the Geological Survey of New South Wales. ; Gilligan, L.B., Brownlow, J.W., Cameron, R.G., Henley, H.F. (1992) Metallogenic Study and Mineral Deposit Data Sheets: Dorrigo-Coffs Harbour 1:250 000 Metallogenic Map SH/56-10, SH/56-11. Geological Survey of New South Wales, Sydney, 509 pages. Ashley, P.M., Creagh, C.J., Ryan, C.G. (2000) Invisible gold in ore and mineral concentrates from the Hillgrove gold-antimony deposits, NSW, Australia. Mineralium Deposita, 35, 285-301. Paar, W. H. (1995): Interessante Mineralfunde aus Österreich (II): Silberminerale vom Madersbacher oder Matzenköpfl bei Brixlegg, Tirol. Lapis, 20 (2), 16. Federico Ahlfeld and Alejandro Schneider-Scherbina (1964) Los Yacimientos Minerales y de Hidrocarburos de Bolivia. (Ministerio de Minas y Petroleo, La Paz); Keutsch, F., & Brodtkorb, M. D. (2008). Metalliferous paragenesis of the San José mine, Oruro, Bolivia. Journal of South American Earth Sciences, 25(4), 485-491. Federico Ahlfeld and Alejandro Schneider-Scherbina (1964) Los Yacimientos Minerales y de Hidrocarburos de Bolivia. (Ministerio de Minas y Petroleo, La Paz); Jiménez-Franco, A., Alfonso Abella, M. P., Canet Miquel, C., & Trujillo, J. E. (2018). Mineral chemistry of In-bearing minerals in the Santa Fe mining district, Bolivia. Andean Geology, 45(3), 410-432. [MinRec 32:480; Spencer, L.J. and Prior, G.T. (1907) Mineralogical Magazine 14, #67, 308-344. USGS Bulletin # 1975, p. 251. Litochleb, J., Šrein, V.: Minerální vazba stříbra a zlata v Ag-Au polymetalickém zrudnění z Nového Knína. Bulletin mineralogicko-petrografického oddělení Národního muzea v Praze, 1995, roč. 3, s. 215-218. Vavřinec L.: Miargyrit z Mikulova v Krušných horách. Časopis pro mineralogii a geologii, 1979, 24, 3, 323. Chauris, L. (2014): Minéraux de Bretagne, Les Editions du Piat, 84. U. Hansper (2006): Zinckenit mit Miargyrit aus Wolfsberg, Harz. Lapis 31 (2), 37. Voudouris, P., Melfos, V., Spry, P. G., Bonsall, T., Tarkian, M. & Economou-Eliopoulos, M. (2008): Mineralogical and fluid inclusion constraints on the evolution of the Plaka intrusion-related ore system, Lavrion, Greece. Mineralogy and Petrology 93, 79-110; Kolitsch, U., Rieck, B., Brandstätter, F., Schreiber, F., Fabritz, K. H., Blaß, G. & Gröbner, J. (2014): Neufunde aus dem altem Bergbau und den Schlacken von Lavrion (I). Mineralien-Welt 25 (1), 60-75 (in German). ; P. Voudouris (2005) Gold and silver mineralogy of the Lavrion deposit, Attika, Greece. Mineral Deposit Research: Meeting the Global Challenge 2005, pp 1089-1092; Voudouris, P. (2005). Gold and silver mineralogy of the Lavrion deposit, Attika, Greece. In Mineral deposit research: meeting the global challenge (pp. 1089-1092). Springer Berlin Heidelberg. Schultz, R.W. (1968) Unpub. Ph.D. thesis, University of Dublin. ; Ryback, G., Nawaz, R. and Farley, E. (1988) Seventh Supplementary List of British Isles Minerals (Irish). Mineralogical Magazine, vol. 52, n° 365, pp. 267-274. Ambrino, P., Blass, G., Boscardin, M., Ciriotti, M.E., Dalla Fontana, G., Kolitsch, U., Martini, B., Milli, L., Salvetti, A., Bonacina, E. (2008): Borgofranco d'Ivrea. La paragenesi a solfuri e solfosali delle miniere argentifere. 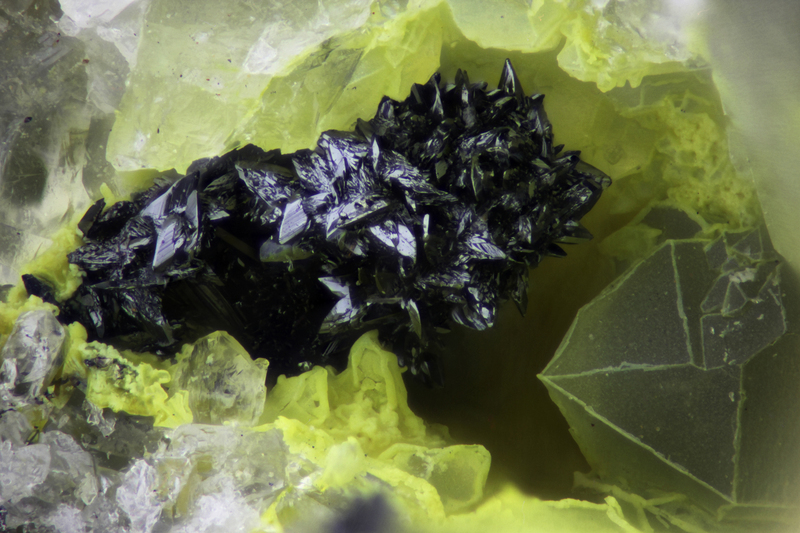 Rivista Mineralogica Italiana, 3-2008, 144-162. Sugaki et al (1982) Journal of the Japan Association of Mineralogists, Petrologists and Economic Geologists, 77, 65-77. Matsubara, S., Miyawaki, R., Shimizu, M., & Yamanaka, T. (2001). Pararsenolamprite, a new polymorph of native As, from the Mukuno mine, Oita Prefecture, Japan. Mineralogical Magazine, 65(6), 807-812.
http://geopubs.wr.usgs.gov/open-file/of03-220/DATABASE/lode_deposits.txt; Nokleberg, W.J., ed., (2010) Metallogenesis and tectonics of northeast Asia: U.S. Geological Survey Professional Paper 1765, 624 p. Min.Rec. : 21:102.; Hyrsl & Rosales (2003) Mineralogical Record, 34, 241-254.; Hyrsl & Rosales (2003) Mineralogical Record, 34, 241-254. Oudin E, Picot P, Pillard F, Moëlo Y, Burke E A J, Zakrzewski M A (1982) La bénavidésite, Pb4(Mn,Fe)Sb6S14, un nouveau minéral de la série de la jamesonite, Bulletin de Minéralogie 105, 166-169; Vizquerra Benavides, J.A. (2006): Preliminary geochemical, petrological and mineralogical investigation of the high-grade Ag-Pb-Zn Pozo-Rico, Uchucchacua, Peru. Unpublished masters thesis, Queen’s University, Kingston, ON, Canada, 205 pp. G. N. Gamyanin et al. (2001) Geology of Ore Deposits, 43, 442–467; Mills S.J., Kartashov P.M., Gamyanin G.N., Whitfield P.S., Kern A., Guerault H., Kampf A.R., Raudsepp M. (2011) Fluorocronite, the natural analogue of β-PbF2, from the Saha Republic, Russian Federation. European Journal of Mineralogy, 23, 695-700. Mineralogical Record, 23 (3), 241-249; Doblas, M., Oyarzun, R., Lunar, R., Mayor, N., & Martinez, J. (1988). Detachment faulting and late Paleozoic epithermal Ag-base-metal mineralization in the Spanish central system. Geology, 16(9), 800-803. Stalder, H. A., Wagner, A., Graeser, S. and Stuker, P. (1998): "Mineralienlexikon der Schweiz", Verlag Wepf & Co. (Basel), p. 38+273. Stalder, H. A., Wagner, A., Graeser, S. and Stuker, P. (1998): "Mineralienlexikon der Schweiz", Wepf (Basel), p. 273. Anthony, J.W., et al (1995), Mineralogy of Arizona, 3rd.ed. : 297; Thomas, B.E. (1949), Ore deposits of the Wallapai district, AZ, Econ.Geol. : 44:663-705; Galbraith, F.W. & Brennan (1959), Minerals of AZ: 25. Troxel, Bennie Wyatt & P.K. Morton (1962), Mines and mineral resources of Kern County, California: California Division Mines & Geology County Report 1, 370 pp. : 284; Pemberton, H. Earl (1983), Minerals of California; Van Nostrand Reinholt Press: 140. Shannon, Earl Victor (1929), Miargyrite silver ore from the Randsburg district, California: US National Museum Proceedings: 74(21): 1-10; Murdoch, Joseph (1939c), Miargyrite crystals from Randsburg, California: American Mineralogist: 24: 773. Ream, L.R., "Idaho Minerals," pg. 99, 1989, LR Ream Publishing, Coeur d'Alene, Idaho, USA in part. Additionally from the RO Meyer collection. Minerals of New Mexico 3rd ed. ; Henry L. Jicha, Jr. (1954) Paragenesis Of The Ores Of The Palomas (Hermosa) District, Southwestern New Mexico. NMBMG Circular 27.